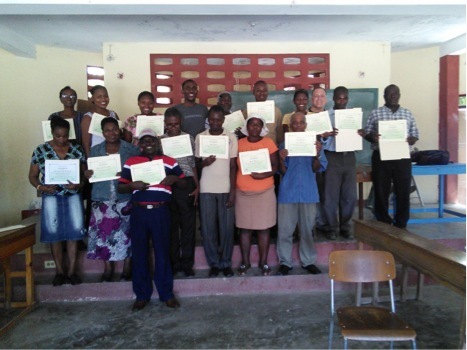 Inveneo is proud to announce that, due to its projects and Project Manager in Haiti Michelet Guerrier, there are now 71 more teachers who are digitally literate in Haiti. This newly published report is about an ICT Pilot Program [Extension of the Transforming Teaching Through Tablets (TTT) project] to improve Haitian teacher capacity and access to digital educational resources. 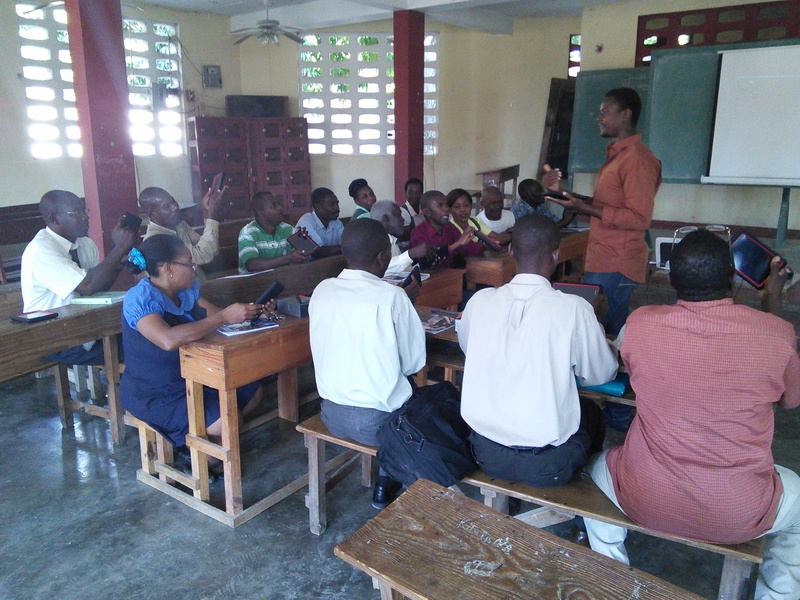 Inveneo implemented this pilot program in three primary schools in three different regions in Haiti from March to June 2014 (Petit-Goave, Hyacinthe, and Cascade Pichon) before we expanded the program to reach more than 30 secondary teachers in Petit-Goave. The program’s main goal was to demonstrate the benefits of using tablets in a school environment to build teacher capacity and make educational resources available for teachers. We re-designed the project to fit not only primary school teachers, but also those working in secondary schools. Read the report and check out all the updates! Michelet Guerrier, Inveneo’s Project Manager in Haiti, recently led a computer training session for the community members in La Vallee de Jacmel, Haiti. 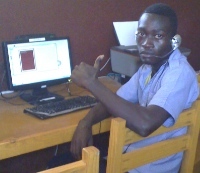 After a 10-station computer lab installation in La Vallee de Jacmel, Inveneo was re-contacted for training recommendations. Once the needs assessment was initiated, Inveneo agreed to provide and empower the community members with basic computer training. La Vallee Alliance selected the candidates to participate in the training. They included teachers, school directors, and secondary school students. 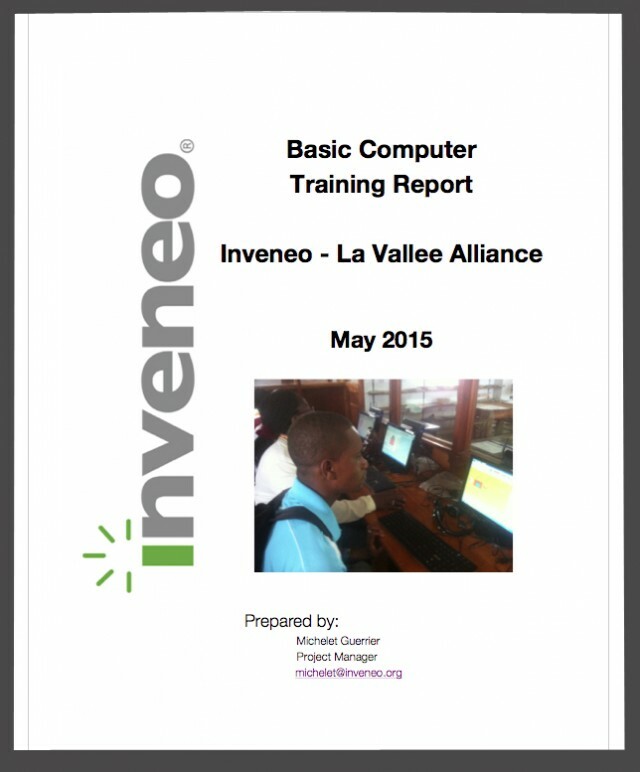 Inveneo and Michelet Guerrier published a report on the computer training course and outcomes. Please take a look and discover the exciting results and impact that a computer training course can make for a community in Haiti! From 2011 to 2013, Inveneo has been widely involved in the Haiti Rural Broadband Network (HRBN), a program created to bring broadband to Haiti in many rural areas. Inveneo worked extensively throughout the project, but when funding ran out, the system Inveneo put in place has experienced setbacks, and achieving sustainability has been a challenge. 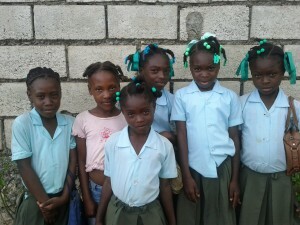 These school kids could benefit from Inveneo’s Haiti Connected Schools program. 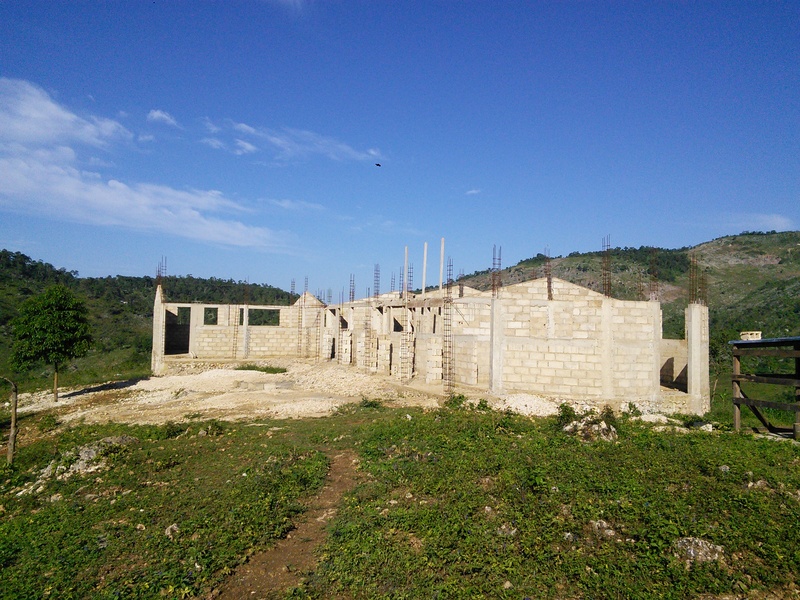 Inveneo’s San Francisco-based Project Manager Kelly Doley recently traveled to Haiti to join Inveneo’s Haiti-based Project Manager, Michelet Guerrier, to assess the HRBN project. 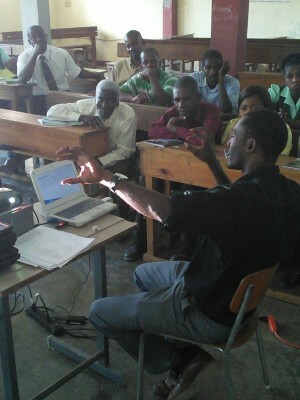 Although the HRBN project has experienced challenges, about 50 schools that participated in Inveneo’s Haiti Connected Schools program initially received improved Internet connectivity through the HRBN. Inveneo is happy that it fulfilled its mission of expanding broadband in areas, and the HRBN infrastructure remains in place. However, the HRBN needs a sustainable business model and strong management from one of Haiti’s many Internet Service Providers (ISPs) for networks to grow or continue, especially in the absence of continued donor funding. However, Inveneo has noticed that multiple ISPs have learned from the HRBN and used the same technologies as Inveneo in building out their own networks to reach remote areas. 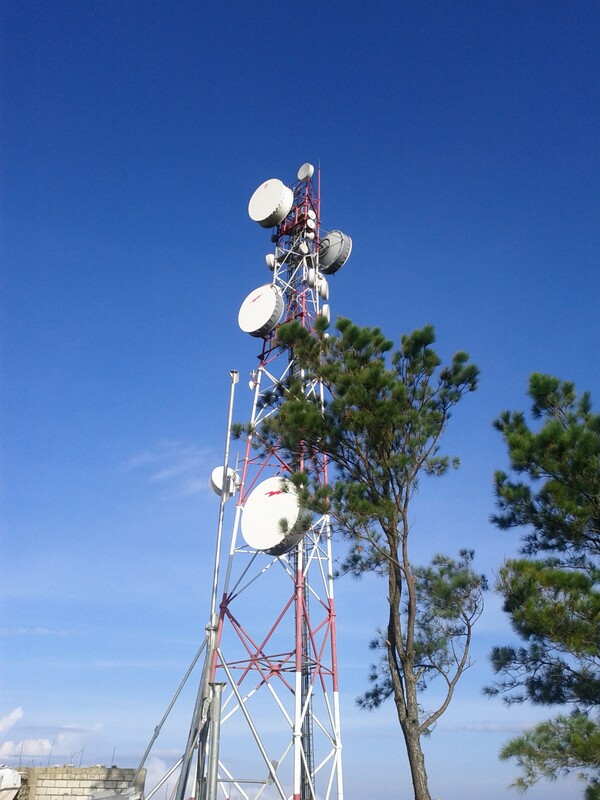 Some of Inveneo’s approximately 50 BATI still work for ISPs to conduct outreach and repairs for the HRBN project. BATI are young Haitians with information technology (IT) skills who have been trained by Inveneo to deploy high speed, broadband wireless networks and new, relevant technology. All BATI benefitted from Inveneo’s training and working as part of the HRBN network. 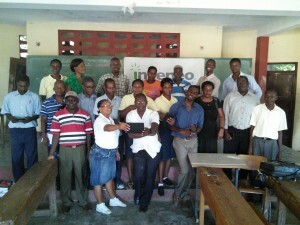 BATIs have a lot of respect for Inveneo and would like Inveneo to expand its presence in Haiti. Inveneo greatly respects the BATI, and recognizes they are a great local and skilled resource that could be tapped into Haiti. Internet connectivity remains a challenge in Haiti, and the HRBN was a successful initiative to expand broadband in remote areas. As with all development projects, achieving sustainability – in this case maintaining the HRBN after the project officially ended – has been a challenge. However, the HRBN infrastructure remains and could be leveraged to help connect the unconnected in Haiti. 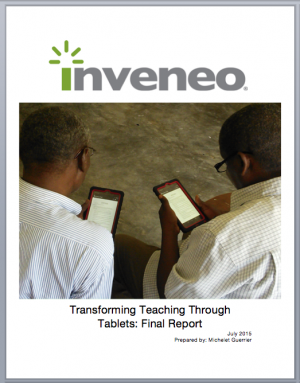 The Inveneo team is currently working on the successful Transforming Teaching Through Tablets project to improve the skills of and resources available to teachers in Haiti. To read more about that project click here. 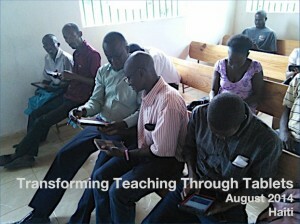 In our continuing efforts to support the participating schools in the Transforming Teaching Through Tablets (TTT) Pilot Project, we have had constant communication with the teachers who received Google Nexus Tablets loaded with content for professional development and attended Inveneo’s ICT training program, since our last August report. Besides regular phone calls and emails to school administrators and teachers, we prepared a two month evaluation which we administer to every teacher participant and school administrator to learn more about what has worked well so far and what needs some improvement. This is so we can provide appropriate support either remotely or on-site. This is a good way to keep the teachers engaged in their own professional development process. We thought it was a wonderful idea to stay in good communication with the teachers to support them when needed and evaluate the ongoing impact of the project. And the perfect time is during school time between September and June (in the case of Haiti) when teachers and students are really active in the teaching-learning process. Below is the summary report from the first two-month evaluation (September-October 2014) from the teachers in Petit-Goave, Hyacinthe, and Cascade Pichon. What has the team learned so far? Since the submission of their learning portfolio that was a requirement for owning the tablet and participating in our certification ceremony that followed, all the teachers have used their tablets at least five days per week. They have used their individual tablet at home as a reference for lesson planning, reading, and browsing the Internet. At school, it is used as a tool for class instruction whenever possible. Bruny Casseus, a 5th grade teacher at Harry Brakeman says, “With my tablet, I take pictures that I use as teaching materials. I use the French dictionary to look up [a] word’s meaning and spelling when I plan lessons. I also use other applications on the tablet to teach math and facts about animals.” Renault Emilien, who is teaching 6th graders at Ecole Methodiste de Hyacinthe, explains that “being able to use a projector with the tablet in our classrooms is making a big difference in how we teach and how our children learn. We are doing more in less time and the students seem to become more motivated to participate in activities in the classroom”. Eight teachers at “Ecole Methodiste Hyacinthe” participated in the program and successfully met the requirements of the program. They attended all training sessions, participated actively in workshops, and created and submitted a learning portfolio. Electricity is still an issue for Harry Brakeman and Cascade Pichon schools. At Harry Brakeman, the teachers have still not found an opportunity to use the projector. The school directed noted that there has been no electricity in the city during the day. In addition, there has been a serious political problem leading to street demonstration in the city since late August 2014 that has terribly affected the functioning of schools in the area. In Cascade Pichon, one school under construction (with the help of an organization called Heart to Heart) is about to finish. Once fully completed, the school might have a solar power system if funding is found. That will be another huge step in improving education in that community. For this question, let me share the teachers’ opinions with you. Question 2: How have your students benefited from your training and use of technology? In conclusion, we can say that these teachers have been learning a lot from the program. New habits have been formed. They have become more aware of what planning teaching for learning involves. And we are happy to have facilitated that to happen. The two biggest challenges encountered since the beginning remain the same: electricity and connectivity. But work is being done to overcome these challenges. The school administrators believe that they will achieve much more with more access to electricity and Internet, which I believe, too. Because we believe that successful technology deployment results from relevant capacity building and ongoing support, we want to keep this healthy relationship with the school administrators and teachers to keep them on the track of improving their professional practice and students’ learning. Again, we would like to thank our partners. Please, feel proud of your valuable contributions in making a positive change in the lives of the most vulnerable. 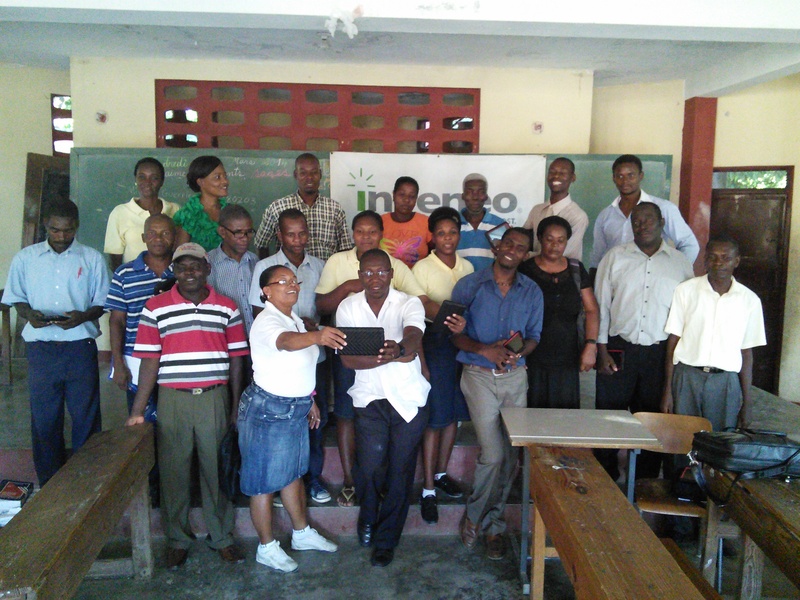 On behalf of these teachers, Emilien Renault, a 6th grade teacher at Methodiste Hyacinthe, would like to congratulate Inveneo and its partners for this beautiful program developed for the improvement of education in rural Haïti. Inveneo is proud to have an incredibly diverse staff. One of our team members, the Project Manager in Haiti, Michelet Guerrier, recently graduated with his Bachelor’s Degree in Business Administration and a Certificate in Community Development from Madonna University, which is located in Livonia, Michigan. 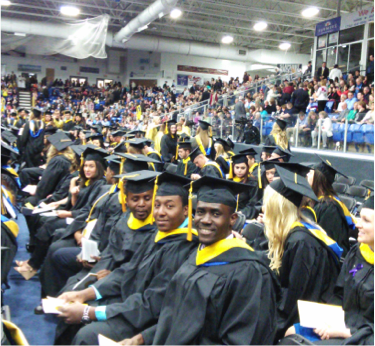 Michelet Guerrier (front) at his Graduation Ceremony in Michigan. Even more impressive, Michelet completed his degree while still living in his home country, Haiti. Back in 2011, Michelet saw an advertisement in the local Haitian newspaper. The ad was for Madonna University who was looking for intelligent students living in Haiti to apply for its first Haitian scholarship program. Michelet quickly applied for the scholarship, and within a few months, was one of the seven winners. Madonna University is a Catholic University, and the Haitian scholarship is supported by the Felician Sisters, members of the Catholic Church. Michelet received books, supplies, and equipment so he could study at home in Haiti and interact with teachers and peers via the Internet. Over the next three years, Michelet worked incredibly hard for Inveneo while also completing courses in marketing research, business management, and community leadership. Finally, this past month Michelet moved to the University Campus in Michigan where he graduated with a Bachelor of Science degree in Business Administration. Congratulations, Michelet! Online classes are becoming a very popular choice for those seeking out higher education. Not only do offsite courses allow for the flexibility in scheduling that so many busy adults need in today’s fast-paced world, but they also offer the convenience of learning from anywhere – a vital component for those living in remote places in the developing world. Michelet says that his education has added incredible value to the work he does for Inveneo. For the past several years, he has managed ICT projects in Haiti with other staff members like Sybille Fleischmann. With his new degree he will continue to train Haitian teachers on Tablets to develop the quality of education throughout the country. Inveneo intends to continue improving teacher capacity through ICT to deliver quality education, and we are happy that Michelet is our leader in Haiti to make that a reality. Haiti is a country filled with students who have great talent, skill, and intelligence. Inveneo is proud to continue partnering with Haiti’s local leaders like Michelet to provide educational resources that will impact students and benefit communities around the country. In March 2014 Inveneo launched a new project for primary school teachers in Haiti. The TTT (Transforming Teaching through Tablets) project is designed to improve teaching and learning in primary schools by providing teachers in rural Haiti with training and access to digital educational resources. 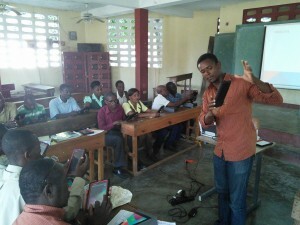 Educators from two primary schools in the area of Petit-Goâve already received Nexus 7 tablets loaded with educational content and tools for professional development. In addition, they are participating in training on how to use the new technology tools to access information, acquire knowledge and collaborate with peers. The training and mentoring provided to teachers are intended to improve their confidence and capacity to deliver quality education in the classroom. Besides the initial on-site training, teachers will be participating in weekly online sessions via their tablets for several months where they will be learning about teaching, about classroom activities to foster 21st century learning and about ICT in the classroom. 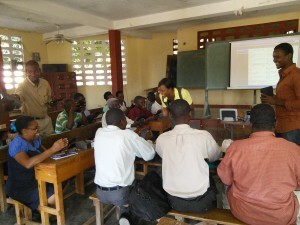 The program was designed with the needs of Haitian primary school teachers in mind. Many teachers in rural Haiti have not received any or very little teacher training and have no access to resources like libraries or the Internet. We made sure the program would be relevant to the teachers’ needs and interests. They need technology, access to resources that support their work, training and ongoing coaching to become independent learners. The Haiti team (composed of PM Michelet Guerrier, Rico Mondesir, and Ronald Benjamin) is supported by Inveneo Education Solutions Director Sybille Fleischmann and San Francisco-based engineers. The team has been responsible for selecting schools, preparing administrators, identifying content, training development, setup of tablets and finally training delivery. We are currently working with 21 teachers, 13 from College Harry Brakeman and eight from Ecole Methodiste de Hyacinthe, a small community located about one hour drive from the city of Petit-Goâve along a bumpy dirt road. There is no Internet connectivity in Hyacinthe available today. The teachers are willing to travel all the way to Petit-Goâve to find Internet access. Connectivity might finally reach their community later this year. The enthusiasm, motivation and interest for learning about technology and improving their teaching skills shows that these teachers are gaining an awareness of new challenges in the teaching profession and want to be ready to prepare their students with competencies for the 21st century. We see this as an important step to improving the quality of education. The teachers were not sure how tablets could help them expand their knowledge and skills until they had the tablets in their hands and started exploring them. They were excited to learn about the tools and what they could do with them. Access to hundreds of books in French and Haitian Kreyol through Library for All, curricula of the Ministry of Education, offline apps and Internet access for research, communication, and collaboration have been described by the school director from Hyacinthe, Thony Domique, as closing the gap between city teachers and rural teachers. In this program, we are working with preschool and fundamental education teachers. This includes Kindergarden and 1st to 6th grade. In the Haitian system, a teacher at the fundamental level teaches all subjects to a class. So what we have is a mix of teachers teaching different levels and age groups with classes of 35 to 50 students. The teachers will use their tablets to access information both offline and online, prepare lessons, create activities for the classroom, and share content with their students using a projector. Wilson Monice, Director at College Brakeman said, “The first impact these tablets will have is on teacher and school image”. All parents want their children to have a quality education, and access to quality education passes through the training of teachers to develop new teaching and ICT competencies to enhance students’ learning. Consequently, schools with these teachers will be described as good schools and will be respected in the community. A teacher with a tablet has access to lots of resources for professional development, references to sample lesson plans, learning activities for students, and content that will help teachers prepare the lessons. An expected outcome will be on the improvement of students’ performance. A better education to the children in the community will contribute to making a change in the life of the community at different levels. The community should start to feel less marginalized as the people get more informed, educated and can participate in making decisions for themselves. We believe education supported by technology can help make this happen and bring hope to the community as a whole. Working as the Project Manager has been such an honor. Being an educator myself, I have been lucky to be able to share and learn from all of these wonderful teachers’ experiences. And the surprise, so far, has been the level of commitment we have seen in these teachers who have so many years of experience. Many of them have been in the teaching profession for more than 30 years, and they agree they need new skills to do what they like doing the most. We hope to inspire them to continue improving their teaching capacity to serve the children in these communities who need quality education most. Thanks to our partners who made it possible to launch this ambitious program. Thanks to Google for providing Nexus 7 tablets for the teachers, and thanks to the Craig Newmark Philanthropic Fund and United Methodist Church of Resurrection for their financial support and assistance with in-country coordination. In June, the Inveneo team in Haiti, Sybille Fleischmann, Michelet Guerrier, and Ronald Benjamin took a trip to Ouanaminthe to visit two schools where we deployed computer labs and trained teachers. This initiative was sponsored by Digicel Foundation and Kellogg Foundation. One of these two schools, Ecole Nationale Ti Laurier, was a concern for us. I am Michelet Guerrier, project manager for the Haiti Connected Schools Program, and I worried about the management of the computer lab, but I was happily relieved. When Ronald and I went to Ecole Nationale Ti Laurier, our visit intended to surprise them, but they surprised us. When I looked at the door and the walls of the lab, there were lots of decorations made by the teachers posted almost everywhere. It was clear to any visitor that it is a well-operated computer lab. A lot more positive things can be expected from this school. And I hope we can use it as a model to inspire other schools, like those in the Haiti Connected Schools Program. In Haiti, schools need more than just relief, they need better access to information and communication technologies to improve student and teacher skills and learning opportunities. 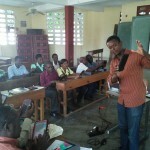 Inveneo collaborated with World Vision, Microsoft, HP, SELF and Voila Foundation to create “The Haiti Connected Schools Program” – a solution that brings sustainable computing solutions and Internet connections to 40 schools in rural Haiti. Inveneo’s Sybille Fleischmann, Inveneo Country Manager Haiti, and Michelet Guerrier, Haiti Project Manager, have been working with Haitian engineers and technicians, to install solar panels, set up computer labs, and connect the schools to the Internet. 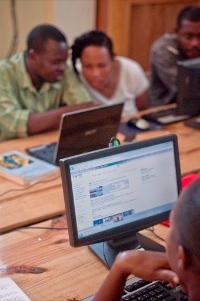 As part of the program, teachers receive basic computer classes. The classes are delivered by Inveneo trained local technicians. 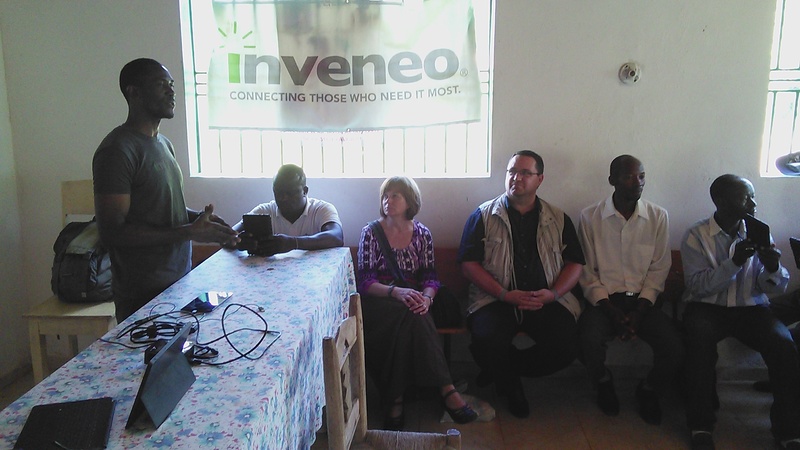 Inveneo’s approach integrates school administrations, Haitian solar installers and local technicians in the preparation, deployment and long-term support of the computer labs. After a school is selected the school prepares for the future computer lab, adds security measures where necessary and purchases or builds the furniture for the lab. When the school is ready to receive the lab the solar panels are installed either on the roof or on poles next to the computer lab and the indoor cabling with inverter and batteries are completed. Shortly thereafter Inveneo certified local technicians install the computer lab and set up the Internet access. Once the lab is ready, teachers are the first to receive a multi-day basic computer course. During this training many of the teachers are touching a computer for the very first time. A key aspect of the program is the BATI – young Haitians with information technology (IT) skills who are trained by Inveneo to deploy high speed, broadband wireless networks and new, relevant technology for educational institutions, like schools, in an entrepreneurial business model. 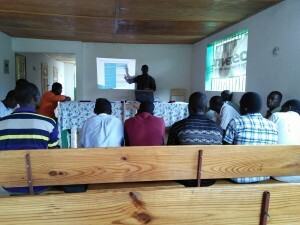 During the school deployments, experienced BATI are training newer BATI, on how to connect clients, deploy and support the computer labs. They also receive coaching and experience providing basic computer classes to teachers and the community. In fact, the program is now entirely run by Haitians and the results have been remarkable. Two computer labs are being installed each week by two BATI teams working simultaneously. The targeted 40 school deployments are on schedule to be completed by September 2012; so far 28 schools have been completed with 12 more to go – each complete with local ownership and local long-term maintenance. Students throughout the country are now able to access online educational resources thanks to the help of The Haiti Connected Schools Program. Inveneo’s quick response to delivering long-term solutions offers students and school administrators the best combination of sustainable computing for years to come.